Hire Oakland Youth! Boost our Future! Are you ready to change a life? 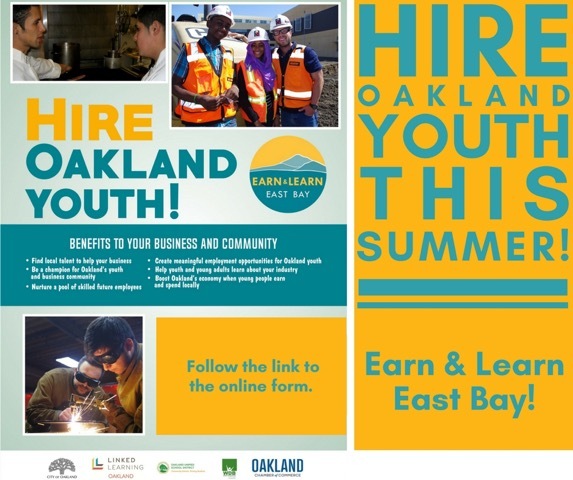 Hire an Oakland Youth this summer! The Oakland Chamber of Commerce is helping recruit businesses to participate in the regional Earn and Learn East Bay Network, a partnership of the City of Oakland’s Youth Employment Program and OUSD’s Linked Learning Pathway Internship Programs (ECCCO): Ensuring thousands of Oakland youth are Earning & Learning! The Oakland Chamber of Commerce, in partnership with school districts, community colleges, and industry employers from Contra Costa to Hayward, is actively addressing the need to align educational opportunities with the workforce needs of industry in the region. A prime example of the Chamber’s work is the East Bay Linked Learning Hub of Excellence, a multi-year initiative made possible with the support of James Irvine Foundation. By turning high school education into a personally relevant, engaging experience for all students, Linked Learning exposes them to previously unimagined college and career opportunities. Research shows Linked Learning students have higher rates of engagement and higher graduation rates than their peers at traditional high schools. This approach to education is helping to create an engaged, disciplined, and productive future workforce for California, ready to succeed in college, career, and life. Find out more about Linked Learning here. Download the Linked Learning FAQs and learn how you can participate in and support this important initiative. How can I get involved with the Oakland Linked Learning Hub of Excellence? Donate computers and other computer equipment to OTX, refurbishment partner for the Oakland Unified School District. Support East Bay College Fund with your time or donations. Become a Linked Learning community partner as a guest speaker or mentor.